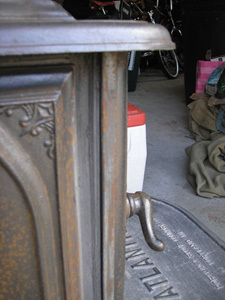 I recently acquired an old wood burning stove for use in my garage. I got the wood stove for free by searching Craigslist Massachusetts over several weeks until I found the right stove for my needs. My garage is an unfinished space so I was not as concerned with how the stove would look, but how it would work. 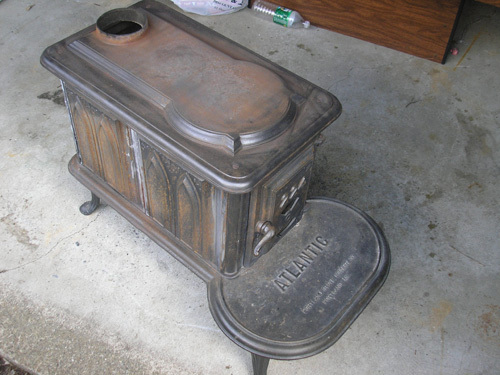 The stove is an Atlantic 224 manufactured by the Portland Stove Foundry Company in Portland, Maine. The stove had not been used in a couple of years and had been stored in an old barn by the previous owner. The owner told me that hey stopped using it when smoke had begun escaping through gaps in the seams and that the rust was recent, only since it had been moved into the barn. 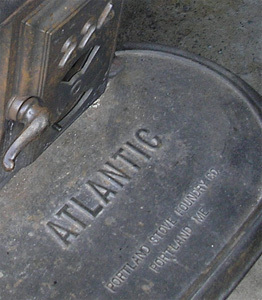 Atlantic 224 - Portland Stove Foundry Co. 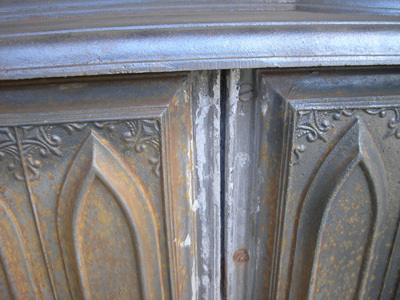 The first step in the restoration process was to remove as much of the rust as possible. I used wire brushes to scrub the surface. Despite a lot of elbow grease it was impossible to get all of the rust spots off. After a lot of work the surface was smooth enough to apply paint later on without fear of it shipping off due to rusted surface underneath. 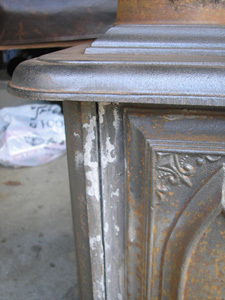 This is a picture of the wood stove during the sanding process. The cement that sealed the seams in the cast iron was old and falling off. Large gaps appeared in many of the seams, and all needed to be repaired. If new cement was applied it would have simply fallen off as the old cement beneath it continued to decay and fall apart. The images to the left shows a corner seam after removing old cement. 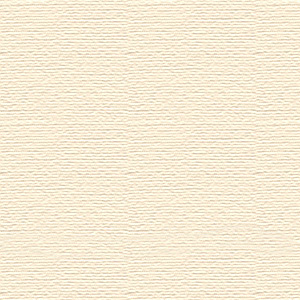 The image on the right shows a corner seams after more sanding and brushing was done. Again, the surface needs to be as clean as possible of rust, old cement, dirt, and other substances before new cement or paint may be applied. Failure to do so will result in the new cement and paint not adhering properly and it will begin to deteriorate more rapidly.